Cairo is a huge megalopolis that boast of urban cultural diversity. If looking for an exotic tourist destination, then Cairo is not one of them. The capital of Egypt is a more oriental destination that is able to fascinate visitors, but also alienated those who come from desperate parts of the world. This dualism of rich and poor is also visible if you are looking for sun. If you want the sun, beach and sea, then you had better head to the beach of Byron Bay in Australia, not to Cairo. Cairo, however, totally has the advantage as the center of an ancient culture and the pyramids of Egypt still remain among the world wonders. The center of Cairo is home to approximately 8 million inhabitants, with a sub urban population of the entire metropolis jumping to a significant 17 million people. These numbers automatically rank Cairo forefront of one of the largest metropolises in the Middle East and Africa and the 11th largest site in the world. Cairo is a major cultural, tourist, political, economic, industrial, financial and business center in Egypt. Also in Cairo is the oldest university in the Islamic world, Al-Azhar University. Geographically, Cairo is located in northern Egypt. Cairo is located on two opposite banks of the River Nile. The Egyptian capital is the place which is immediately south of the point where the Nile leaves surrounded by the Desert Valley as it splits in its delta. The central part of Cairo is spread along the east coast of two islands. The total area of Cairo is 214 sq. km. Cairo has always been dependent on the Nile there. Founded officially somewhere around 969 years, and centuries ago this place was inhabited. Low levels of the Nile in the 11th century added new sites to the area of Cairo, during 1174 the island Geziret al-Fil appeared, who later was associated with drought and now forms the region of Shubra. At the beginning of the 14th century a new island formed that is now divided into two parts - Zamalek and Gezira. Over the centuries the Nile has shifted its bed. Therefore today the newest parts of the city are situated near the river. In the southern direction from the center, the new Cairo is part of the old city, where you can see remains of the former Capital of the fifth century. 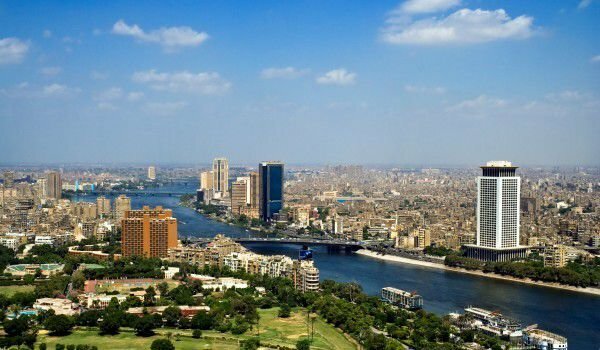 In the northern part of Cairo is the region Bulak which emerged in the 16th century as a port, and today is the main industrial area of Cairo. East of central Cairo you can see one of the biggest attractions of the Egyptian capital - the citadel, built by Fatimidite after the founding of Cairo. This historical monument is surrounded by the old Muslim quarter. While western Cairo is dominated by broad boulevards, open spaces and contemporary architecture with a European influence, the eastern half of the city remains less developed. There chaos prevails, the people are poor, the streets are very narrow and crowded with small, arranged side by side homes. On the western bank of the Nile, which over time became part of Cairo is part of the city's historic and famous town of the Giza pyramids. Living there today are about 3 million people.